The most iconic of Filipino food, adobo is a dish of meat (often, pork or chicken or both), or meat and vegetables, braised in vinegar, garlic, peppercorns, and bay leaf. The name of the dish came to use only after the arrival of the Spaniards in the 1500s who saw the natives cooking a dish some of the ingredients of which were similar to those found in the Spanish curing mixture called adobo. The name stuck despite the fact that Filipino adobo is essentially a stew rather than a curing method. There are so many variants of adobo, both regional and personal, that there are cookbooks devoted entirely to the dish. Contrary to the popular notion that it is the presence of soy sauce that makes adobo what it is, adobo with soy sauce is only a variant. Some adobo dishes are seasoned with salt or patis (fish sauce) rather than soy sauce. This recipe is for the universally loved chicken adobo with soy sauce. Tossing the rice in the reduced adobo sauce makes sure that everyone gets a good share of the sauce. Quail eggs make an interesting addition to the dish. Because a generous amount of vinegar is an essential ingredient of adobo, use a non-reactive cooking pan — that means a pan made of a material that does react to acid. Cast iron, (unlined) copper and aluminum are reactive metals so avoid them when cooking adobo. Good choices include ceramic, clay and stainless steel. Cut the chicken quarters into legs, thighs, and backs. Heat the cooking oil in a thick-bottomed wok or frying pan. Add the chicken pieces, skin side down, to the hot oil in a single layer. Cook over high heat until the undersides are browned. Flip them over to brown the other side. Pour in the vinegar. Add the garlic, crushed peppercorns and bay leaves. Cook over high heat, uncovered until the liquid is reduced by half. Pour in the soy sauce. Add the sugar. Stir. Cover, lower the heat and simmer for 45 to 55 minutes or until the chicken is tender and the sauce has been reduced to about two tablespoonfuls. During cooking, taste the sauce occasionally and add more soy sauce, if too bland or just to acquire the balance that pleases you. Add the rice to the sauce in the pan and toss a few times. To assemble, spread the rice on a platter. 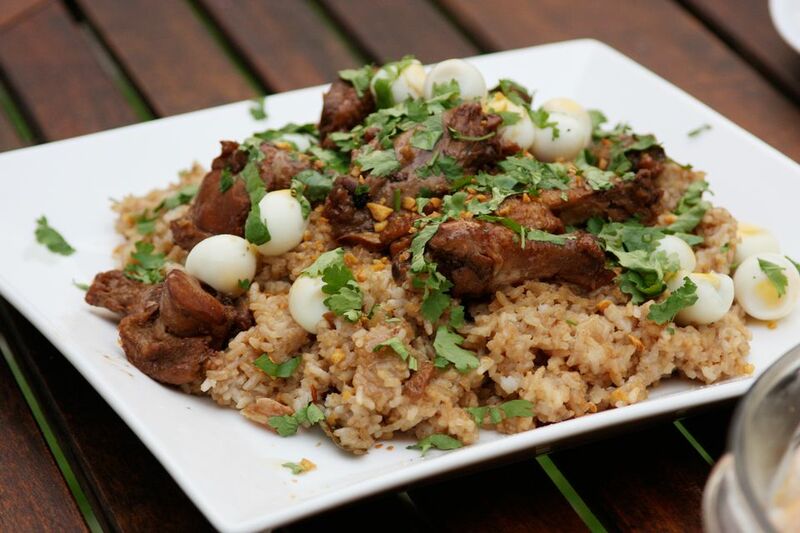 Scatter the chicken adobo and quail eggs over the rice. Sprinkle with fried chopped garlic and, optionally, torn cilantro.